49 posts categorized "The Week in Meat"
For our overseas readership (a confusing phrase, when one is a transplanted American), this was an incredibly important weekend. Although most sensible god-fearing, mammal-devouring folk aren't afraid to flame their meat year round, Memorial Day is the traditional starting pistol for the rest of the population. Bacon: A Love Story is in stores (including Amazon). Why haven't you bought it yet? The Blue Ribbon Bacon Tour, as recommended by Heather 'See Above' Lauer, has hit the road - with the first stop in Phoenix (where they can fry bacon on the sidewalk in June). Further destinations will include prominent cities like Chicago and Minneapolis as well as dens of iniquity like Vegas and DC. The cute people at Cakewrecks have a post on meat-themed cakes. I particularly like the one that just looks like a huge hunk of raw meat. Unsubtle. Tasty. Not only are bacon sandwiches good for you (kinda), but the Guardian ran a lengthy excerpt on Kansas City's American Royal BBQ Competition. Believe it or not, although the writer does a great job, the American Royal is actually even better than he describes it. Biggest party in Kansas City plus vast tracts of meat. The entire midwest smells like smoked pork for a week afterwards. To celebrate the upcoming inauguration of the 44th President of the United States of America, we are treating our customers on this side of the pond to a Free Americano! From Monday 12th - 16th January 2009, leading up to President-elect Barack Obama's inauguration on the 20th January, customers can visit our stores and live the "Americano dream" with a complimentary coffee. Simply visit one of our participating stores and declare "Yes We Can" to a member of our team to receive your coffee. With coffee as good as our doughnuts, while there why not treat yourself to a Cinnamon Bun, our feature doughnut for January! This is quite sweet, but also extremely wrong. Americanos are a hideous bastardization of a good cup of coffee. Americans are prone to drinking coffee. Normal coffee. 'Filter' coffee. 'Brew' coffee. 'Percolated' coffee. Not espresso with added hot water. There's a difference, and you'd think that Krispy Kreme would know it. Especially since they're one of the few chains here that actually does serve a normal coffee-coffee. My mom taught me never to make important decisions on an empty stomach, but apparently, that doesn't apply to everyone. Just check out this list from Saveur magazine -- the breakfasts of politicians, journalists and other insiders. It looks like most of Washington subsists on granola and Starbucks, which, frankly, explains a lot. Also, here's something I never thought I'd say: Thank god for Mike Huckabee. Come on people, you're ruling the free world, TREAT YOURSELF TO SOME BACON. Bonus: What's up with Nancy Pelosi?! Classic booze ads from Gawker (via Anne). They're all great, but my favorite is the Mardi Gras one. 'Bourbon - empowering shameless lechery for over sixty years'. The Maw. I still want one. (Although our current one is doing alright for himself). This woman creates comedy sketches from old shopping lists (from NPR, via Lindsey). Checking out other shopping carts has always been a favorite pastime of mine. I'm also fascinated by supermarket segmentation. Why did Tesco always try so hard to get my to buy vegetables? Were they worried about my health, or did they figure I was a safe bet never to take advantage of their offers, no matter how generous? Relax, Lower Hudson Valley Residents, you don't have a serial killer. Just lax hygiene. From the Lohud Journal. Cheese is made with veal stomach (from Consumerist). And other fun facts about how fast food restaurants regularly shaft vegetarians. MIDDLETOWN, Ohio -- Police in Middletown arrested a woman Monday night who they said was dressed in a cow suit and seen acting erratically. Michelle Allen of Middletown was arrested on one count of disorderly conduct on accusations of getting in the way of traffic on Wilbraham Road and chasing children in her cow suit, WCPO-TV in Cincinnati reported. She also urinated on a neighbor's front porch, police said. According to officers, Allen talked back and threatened to cause problems in the jail if she was arrested. Allen appeared in court Tuesday morning dressed in the suit. It is not clear why she was wearing the costume. 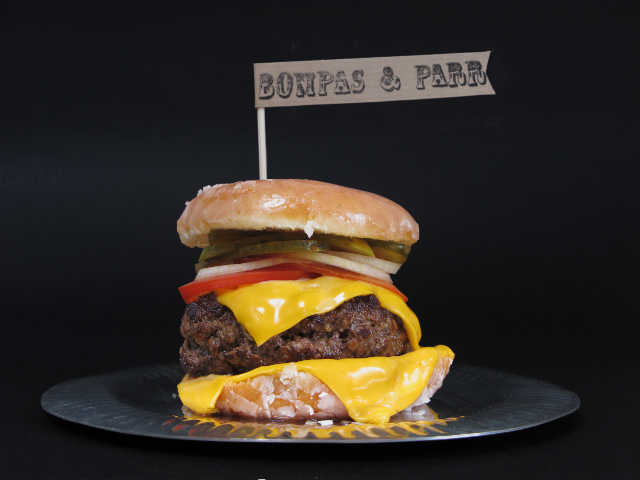 Today, architectural foodsmiths, Bompas & Parr unveils the menu for the Monnow Valley Drive Thru, a pop-up restaurant created for the Abergavenny Food Festival Fringe. A sugar glazed donut burger will headline the main menu while breakfast diners can enjoy bacon buttes made with donuts instead of buns. Cook on TV with "Taste the Nation"
I'm less interested than being a contestant than getting to be one of the 'country's fiercest critics'. I wonder if there's a separate competition for that. ITV Productions is looking for contestants to take part in a brand new, day-time cookery series called Taste the Nation. If you have a passion for food and want to represent your county in a national cookery knock-out, then this is the show for you. More kudos to Subway. Not only are their salads a magical way to lose weight ('magic' meaning I pay £4 for a plate of lettuce), but also they've starting taking a stand against people who ORDER THEIR SANDWICH while ON THEIR DAMN PHONE. Phone/ordering people drive me nuts as well. They slow everything up for everyone else, look like dorks and invariably make me feel sorry for the poor sandwich jockey behind the counter. Well done to you, Idaho Subway! Meanwhile, in a different fast food franchise chain, McDonalds has joined the National Gay and Lesbian Chamber of Commerce, and set off a protest group by doing so. Protest complete with Youtube video. No protests necessary here... Beijing will be sweeping the dog meat under the carpet for the Olympics. Or, perhaps they're just serving it as meatloaf. To Ziggy. A look into the world of comic strip meat, over at the Comics Curmudgeon. Finally, a bit of fun: An interactive list of the top hamburger chains. In-N-Out Burger is dominating the competition.